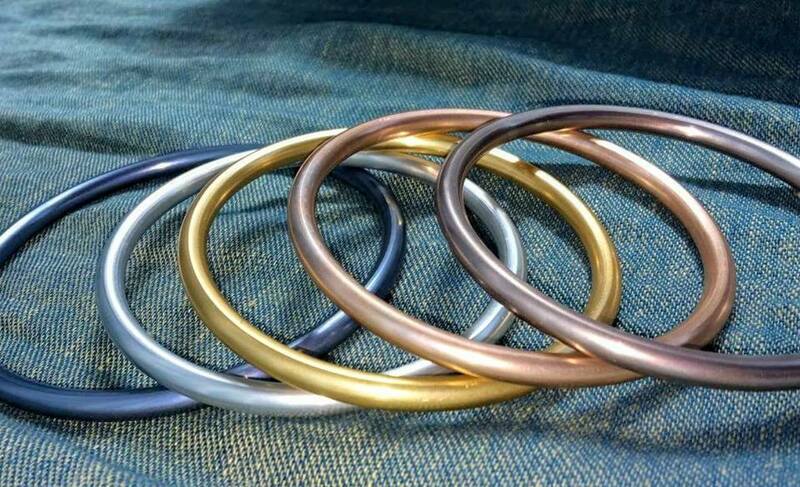 I use only rings manufactured specifically for baby slings by SlingRings.com, as I find them superior in safety, weight, and appearance. All fabrics are chosen for their softness, durability, and strength. If I wouldn't wear it myself, I don't sell it. Every sling is customized -- I don't sew it until you've ordered it. Length, color, fabric, shoulder style, and additions are all chosen by you, for you. Is my sling sewn inside-out? The hemmed edge of in-stock slings is sewn so that it is on the outside in the body of the sling. This is not a mistake, but a comfort factor: I have found fewer red marks on my children's legs when the hems are on the outside than when they are inside. This also means that the hem does not show in the tail of the sling. Since the bottom edge of the sling rarely shows, and the top edge is generally folded by wearing anyway, I feel this is a good tradeoff. I do fully finish the hems with a 1/2" fully-enclosed hem, so I don't think it's a bad look (see sample at right -- thread is shown in black to highlight its placement, but will actually match the fabric color). If you would prefer to have the hems inside in the body of the sling (so that they show on the tail), please make a note of it when you order. Why not a serged edge? I don't use serging on woven fabrics (like twill, tencel, silk, etc.) since I don't personally like the way it looks, and I am not 100% confident that a serged edge will hold up to years of use; some I have seen appear to be prone to fraying, and with time, that can lead to tearing. I use only rings made by SlingRings.com -- after testing a number of different kinds, including the heavier steel rings, I came to the conclusion that these are the safest and most attractive available, and that they are well worth the small extra cost. 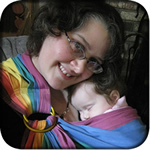 SlingRings are made especially for baby slings, and are weight-tested to 250 pounds. 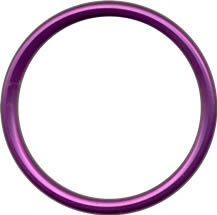 Both the nylon and aluminum rings are very safe, will not break with even abnormally rough usage, and are quite attractive! 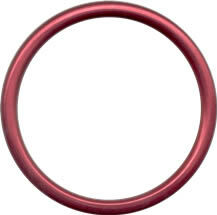 Aluminum ring colors: Ring colors may vary slightly from those pictured; each batch is a little different. Also, because of the anodizing process by which the color is applied, the darker rings may have two tiny plain dots where the ring was held while being anodyzed. 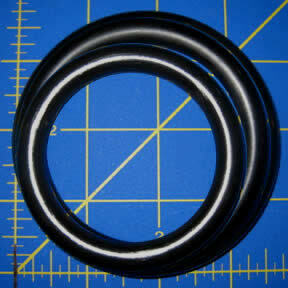 This is not a flaw, but an artifact of the manufacturing process. Occasionally, some batches of rings may have small scratches. These are cosmetic only and do not affect the function of the rings, but if you are particularly detail-oriented and will be examining the rings at close quarters on a regular basis, please make a note in your order of a second choice in colors, in case your first choice tends toward these little blemishes. 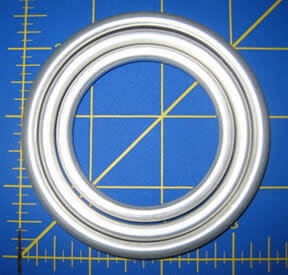 Outer 2.5" 3" 3.5" Outer 3" 3.325" 3.625"
SlingRings was the first company to produce aluminum rings for slings. Run by a wonderful couple in Arizona, they have always been careful to use baby-safe materials that are also safe for their employees to handle. Unfortunately, the standards kept by other companies are not always so high. Ring recalls have been carried out only for rings manufactured in China, which is where shiny rings have been made. Additionally, the standard process used to give aluminum rings a shiny finish uses hazardous chemicals that can be dangerous for those who work on the rings. Enter SlingRings new hand-buffed rings! These have a luster and shine that rivals those made using unsafe processes, but without the hazardous chemicals. These rings are more time-consuming to finish -- they are literally hand-buffed rather than finished in a chemical solution -- so there is an additional cost per ring. I may not have all colors in stock at all times. Just as you'd wash any new garment for yourself or a baby before using it, I recommend washing your sling when it arrives, unless it's noted in the description that the fabric has already been washed. It's not germs that are an issue so much as the sizing and dyeing residues that can remain in the fabric; these will wash out, but until they are washed, the chemicals remain on the fabric. Each fabric type has washing directions on its product page, and these are included on the back of the packing slip with your sling, as well as on the innermost tag attached where the rings are sewn in. I am unable to provide washing directions for customer-sent WCRS; please consult the wrap manufacturer's website for this information.